Script Formatting - Do Script Readers Even Care? Blog Script Formatting – Do Script Readers Even Care? Script Formatting – Do Script Readers Even Care? A recent client of Screenplay Readers expressed concern over a script formatting issue. In her case, she had a phone conversation scene, a few “V.O.”‘s were missing under some of the characters’ names. So she was a bit worried because she’d already submitted the draft to a script contest. She asked somewhat cautiously: would the contest “ding” her screenplay for something like that? It’s true that a script contest reader, or any other professional screenplay reader, might probably think less of a spec script that was less pretty or professional looking. But we screenwriters really shouldn’t panic when it comes to forgetting to dot a few i’s and cross a few t’s. In our recent client’s case, it likely hurt her less that she’d missed a few (V.O. )’s than it did that she used (V.O.) (voice over) in an intercut telephone scene, instead of (O.S.) (off screen), or just using INTERCUT: at the head of the conversation. But even using (V.O. ), while technically not the best choice for an intercut conversation, phone or otherwise, probably wouldn’t even register as a problem for most people reading her script. 1) The screenplay she was worried about the (V.O. )’s for simply flows like butter. That is, her words and scenes are so well-written and gingerly-paced that I’m convinced most readers would simply breeze past the (V.O. )’s, even though said (V.O)’s were used somewhat incorrectly, and even though a few of them were missing. 2) This particular script formatting issue is very, very small. And most script readers know not to sweat the small stuff. If a spec script is overflowing with typos and formatting glitches, using (V.O.) incorrectly might get a mention along with the other errors and offenses, sure. But in a situation where that’s the only thing wrong with the script’s format, and especially if that particular script reads in a breezy way that keeps the reader engaged, you can bet most readers aren’t going even notice, let alone mention such a thing. Bottom line: A screenplay’s most vital components are its readability and its ability to entertain and engage. If you can do those two things, rest assured, most screenplay readers at contests, agencies, and production companies, will overlook a great deal of bad formatting, and will most certainly overlook minor things like (V.O. )’s in a few wrong places. That being said, it makes no sense whatsoever to send your spec script out into the world with minor errors. Not with the wide range of free resources on script formatting, script formatting guides, and free and affordable screenwriting apps available to nearly every screenwriter out there on yonder internets. I’m sure you’ve heard the extremely complex, insightful script formatting maxim: If it looks like a script, it’s a script. If you look like a professional screenwriter, you’re a professional screenwriter. I don’t mean what you wear or what you drive or where you golf or what fauncy island you and your golf carts summer on. Professional screenwriters make typos. Professional screenwriters sometimes stray from standard script formatting. But what professional screenwriters don’t do, at least the good ones, is fail to engage and entertain. So what does that mean? 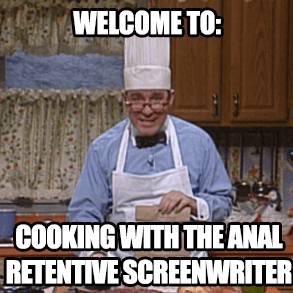 What exactly is the formula for engaging and entertaining with a screenplay? Well, in my experience, it’s a witches brew. A panoply of disparate, often-conflicting ingredients. One… one of those key ingredients is how your script is presented with regards to format and the like. But there are a million others in that brew that count just as much, if not more, than how your script looks: concept, dialogue, brevity, plot twists, how you introduce characters, originality, voice, pacing, structure, and all sorts of other artistic and technical choices you make with every line of your screenplay. That is to say, if every single page of your screenplay exudes entertainment and engagement and readability, you’ll be perceived as a professional screenwriter, whether you’ve used (V.O.) wrong in a few phone conversations, or you’ve misspelled a word or two. So don’t sweat the small stuff!™ Producers, talent, executives – they don’t sweat the small stuff, so you shouldn’t either. Get your format right, or as close to right as possible, and focus your energy on engaging and entertaining. The biggest contest isn’t one you enter your script into. It’s you versus yourself. It’s the you, the screenwriter who worries inordinately about dotting i’s and crossing t’s, and the you who wants to move an audience with your words. So buy or download some software, or Google “script formatting” (Wikipedia can set you straight, as can many other online script formatting guides), or hire a script formatting service like ours at Screenplay Readers (although that’s probably the most expensive route) …then stop worrying about it! Only then can focus on what’s most important: engaging and entertaining your audience.